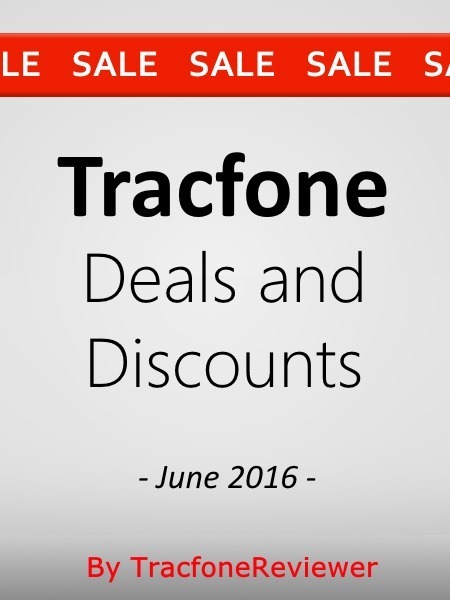 Below we share some great deals on Tracfone phones, as well as unlocked devices. TracfoneReviewer strives to provide money-saving tips and other helpful information, and we hope you find this post useful. Tracfone offers a number of different cell phone options that consumers can purchase to use with Tracfones prepaid service. These phones, including plenty of smartphone options, are available from a wide variety of sources, which can make it hard to know where to buy from, or where to get the best deal. Here at TracfoneReviewer, we spend a lot of time keeping up with the latest developments, and we usually see where to find certain phones for the cheapest. In general, Tracfone devices are cheaper if you buy them on Amazon, eBay, HSN or other retailers rather than the Tracfone website. 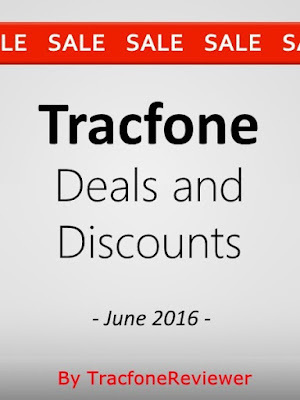 Below we are providing some of the latest deals and discounts we have found on Tracfone cell phones. We are also including a couple of unlocked smartphones that could be used with Tracfone BYOP if you're interested in going that route. With Tracfone BYOP, you can get a much more advanced phone compared to those offered by Tracfone, at a great price. Please note, while the phones we recommened below should work with Tracfone BYOP, you have to enter the phone's ESN or MEID to be sure. To learn more about bringing your phone to Tracfone, visit our Tracfone BYOP page. Now, let's get to the list of deals! Below are a collection of great deals on Tracfone devices, as well as some phones you could bring to BYOP. This list is in no particular order, and these are just some recommendations of phones at good prices. This CDMA (Verizon) smartphone has a 4.5" touchscreen and comes with Android 4.4. It isn't the latest, but offers some really great features and performance, especially for the money. Take a look at our full review of the Samsung Galaxy Core Prime to learn more. With this deal from HSN, you get the phone plus 1200 minutes and 1 year of service (a 1 Year/400 Minute card tripled) for just $90. The airtime alone is worth $100, making this a really great deal, even if you just want to airtime. You can always give the phone to someone else to use as a WiFi device, or activate it. View the Samsung Galaxy Core Prime on HSN. The Sonic features a 4.6" touchscreen and is capable of 4G speeds using GSM networks (AT&T). It uses Android 4.1, and only has about 2 GB usable memory. See more specs and details in our review of the Alcatel Onetouch Sonic. We don't recommend this phone unless you plan to use it for very little beyond calling, texting and surfing the web or email. But at the price of just $20, it might be a good option for a backup, a phone for kids, or just a WiFi device. It is a better choice than the Alcatel Onetouch Pixi, which retails for $10-20. Find the Alcatel Onetouch Sonic on Amazon. When the LG 306G was released by Tracfone it was one of the most advanced phones a Tracfone users could get, but that was several years ago. Now, it is a fairly outdated phone, and doesn't have the Android OS, meaning you can't install apps. However, if you're looking for a phone to use for calling and texting, the LG 306G does that very well. See our full review of the LG 306G to learn more. At just $7, this is the cheapest Tracfone you can buy if you just want a phone, or need a backup option. The Samsung Galaxy S5 has a ton of great features. Most notable is the 5.1" touchscreen, 16 MP camera, and 16 GB of internal memory. The phone comes with Android 4.4.2, but can be updated to 5.1, and perhaps even 6.0. This unlocked smartphone can be brought to Tracfone's BYOP program. The main benefit of buying this unlocked is the much cheaper price. The Tracfone Samsung Galaxy S5 currently retails for $499. But you can get this unlocked (and refurbished) Galaxy S5 for just $162. View our Review of the Tracfone Samsung Galaxy S5 to see more specs, and understand your options. View the Samsung Galaxy S5 on Amazon. The iPhone 5 has a 4.0" touchscreen, 8 MP camera and uses Apple's operating system which has access to many apps in the Apple App Store. This version of the phone uses GSM technology. As some of you may know, Tracfone will be releasing a variety of iPhones to use with their service, including the iPhone 6S. Visit our recent post, New iPhones coming to Tracfone to learn more and see the latest. We don't know when the phones will be released, but it is very likely they will be expensive, closer to $500. So if you want an iPhone on Tracfone, but don't want to spend the big money for it (or wait), buying an unlocked iPhone to use with Tracfone BYOP may be your best option. That concludes our list of Tracfone deals and sales for the month of June, we hope this help you find the best deal when buying a new phone. If you're looking for a new phone, but didn't see any you liked in this list, you might want to check out our recent post about a number of new Samsung and LG phones coming to Tracfone. Don't forget to also follow us on facebook to keep up with the latest news and information. Thanks for visiting, and leave a comment below if you have any questions, or want to share a deal you've found. 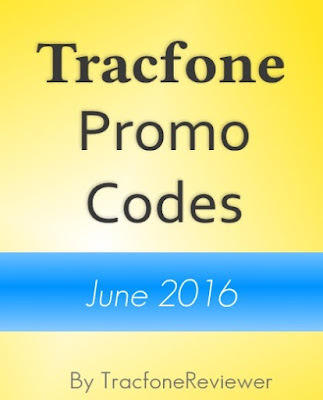 Each month TracfoneReviewer collects and shares the latest promotional codes to use with Tracfone. We are not affiliated with Tracfone in any way, but strive to provide useful news, information and money saving codes to consumers. 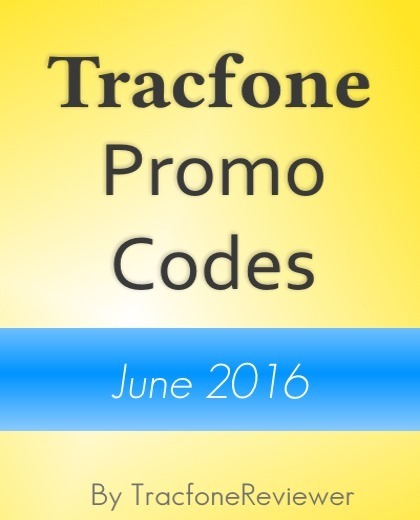 New promotional codes for Tracfone for the month of June are now available and we have collected them to share here on our blog. Tracfone releases these codes to be used with their Airtime cards when adding minutes to your device. You can get from 20 to 300 additional bonus minutes, depending on which card you are using. Each promo code is for a specific airtime card, but some can be used with other airtime cards. For example, the code for a 60 Minute card will work with the 120, 200 and 450 minute airtime cards. The codes for the 400 Minute/1 Year cards will not work with any other cards. Below you will find just the latest promo codes for each airtime card that are valid and working for June. We also have a full list of codes, which includes more codes (some may be expired) on our main Tracfone Promo Code page. We share much more on our blog than just the promo code lists, so if you aren't familiar, take a look around. We recently shared details about Tracfone's plans to release several iPhone versions to consumers. Tracfone is also rolling out a number of new Android smartphones, including the LG Treasure, and many more. But remember that these Android smartphones cannot be used with Promo Codes, which is unfortunate. Now, let's get tot the list of coupon codes. Some codes may only be used once, while others can be used multiple times. It is usually easiest to add airtime and codes online, on the Tracfone website. These are the new promo codes for June, we will continue to keep them updated. Please let us know in the comments which code you used, and how it worked. Follow us on Facebook where we have an active community and post the latest news and information. You may also find our recent post about Why Consumers use Tracfone, and Other Interesting Answers fun to read. In it, we share a number of results to a recent survey we conducted about Tracfone.